Marshall Electronics Optical Division - Ultra Low Light Sensitivity Allows Monitoring in Almost Total Darkness for the automobile, industrial video, covert security, and surveillance markets. This micro size, state-of the-art camera is only an inch-and-a half square, yet is a full function, low light CCD camera with 380 lines of resolution and a built-in "C/CS" mount. Because of a new high-tech sensor, this camera needs only 0.05 lux, which outperforms human sight in many low light conditions. At an inch-and-a-half square, it can fit almost anywhere. 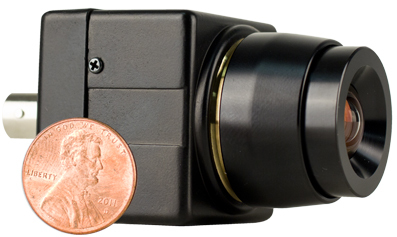 With the "C" mount, there is a whole series of miniature, standard, and microscope lenses to choose from, making this an excellent choice for low cost machine vision, robotics, and computer imaging applications. 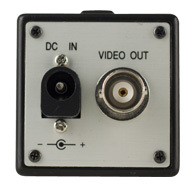 Operation on 12 VDC, 100 mA, the camera is ideally suited for all security and safety monitoring. Because of its small size it's also well-suited for hidden camera applications or in areas which are physically impossible for standard size cameras. The electronic iris built into the circuitry automatically adjusts from dim to bright lighting conditions with very low smear and anti-blooming under high contrast conditions.